Parking: Roadside parking just north of the Cross Keys Public House on the A683 Sedbergh to Kirkby Stephen road, approximately 4 miles from Sedbergh (grid reference SD 698 969). Facilities / refreshments: Pub at the start of the walk. Pubs, cafés and toilets in nearby Sedburgh. This walk involves a steep climb up the side of the waterfalls, and a steep descent off Great Dummacks down Pickering Gill. This is a walk that should not be attempted in the mist or low clouds. From the roadside parking a few yards past the Cross Keys Public House, follow the footpath sign for "Cautley Spout" and drop down and cross the wooden footbridge over the River Rothay. Pass through a small wooden swing gate on the far side of the bridge and follow the gravelled path around to the left. In front now is Pickering Gill which runs down from Great Dummocks. This is the route back down from the Calf. The gravelled track runs initially in the direction of Pickering Gill and Cautley Holme Beck, before swinging around to the right, around Ben End, as it starts to slowly rise and make its way up the valley floor. Directly ahead now in its full glory in Cautley Spout, flanked on its left-hand side by the grey, menacing mile wide Cautley Crags. Continue up the grassy track that heads up the valley to the base of the falls. On the way there, the path passes a small plaque which remarks on the work which has been currently carried out on the footpaths with help from the millennium project. It also describes the surrounding area over the years. Upon reaching the bottom of the falls, the view up looks a little daunting. The water cascades down in a series of falls over the rowans, ferns and a variety of mosses which cling to the rocks. The path follows a grassy slope to start with and then climbs up a series of man-made steps keeping about ten to twenty yards to the right of the falls. As the path winds its way up the hillside, behind there is an excellent view back to Cautley Holme Beck in the valley bottom as it meanders its way down to join the River Rawthey, beyond which the imposing mass of Baugh Fell can be seen. 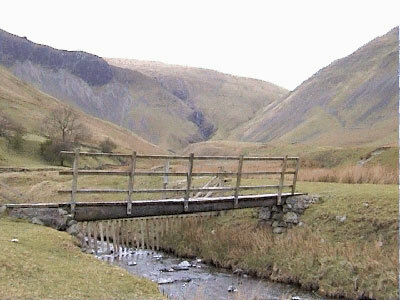 The path dips briefly to cross Swere Gill coming in from the right, before continuing its climb upwards. As the path flattens at the top of the falls, do not cross over the water but follow the path as it hugs the right-hand side of the stream (Red Gill Beck). The path continues climbing slowly up the valley alongside the water for about one third of a mile, where on the far side of the water there is a ruin of an old barn. Shortly after this, keep to the right-hand side of the water where the two becks meet. The right-hand branch (Force Gill Beck) is followed, ignoring the continuation of Red Gill Beck, which branches off to the left. This valley is then followed for a further half a mile, where at the head of the valley, the main stony path from Bram Rigg Top to the Calf is met. Turn right onto this path, and follow it for the final hundred or so yards to the triangulation point on the Calf (676m / 2220 feet). From the top, head back down to the col where the path up from Force Gill Beck met the Bram Rigg Top to the Calf path, and continue straight ahead on this path up onto Bram Rigg Top and then continue on to Calders. Where the path meets a fence turn left following the path alongside the fence, ignoring the main path to the right which heads back down towards Sedbergh. Follow the path alongside the fence for a couple of hundred yards and continue straight ahead across Great Dummacks in a north-easterly direction as the fence swings around sharply to the right. Cross the wide expanse of the Great Dummacks, and pick up the path that encircles the top of Cautley Crags. Be very careful here as the visibility is not very good, and there are shear drops off this path over Cautley Crags. Turn right onto this path, and follow the path around to the end of the crags before dropping down steeply to pick up Pickering Gill. Ahead now again can be seen the Three Peaks. Continue steeply down the right-hand side of the Gill turning right at the bottom on meeting a wall. Follow the path contouring around the hill for a couple of hundred yards, and then drop down onto a track by a barn. Turn left along this track, pass through a gate, then cross a wooden footbridge, which enters back out onto the outbound path. Turn right onto this gravel path and follow it back the final few yards to the footbridge over which is the roadside parking.